These aren't just run-of-the-mill D-Rings, these are made from forged steel, Quenched and Tempered. They are rated for pulling and lifting and have excellent welding qualities (reference American Welding Society specifications). 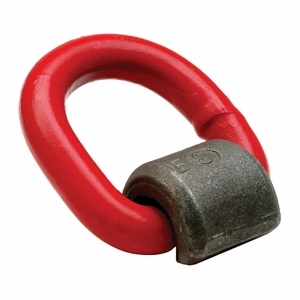 They are widely used on farm machinery, trucks, steel hulled marine vessels and material handling equipment. The ratings shown below are for a 5:1 safety factor, but you can also rate these links with a 4:1 safety factor (see product specifications link for more information).